Our survey results revealed the most-cited drivers behind voice over IP implementation are related to cost savings. Sixty-four percent of respondents said cost savings from telecom savings drove VoIP implementation, while 48% of respondents cited cost savings from operational efficiencies. But where does voice over IP (VoIP) fit into today's UC market? According to Stephen Tong, senior director of infrastructure services at Avanade, VoIP in terms of traditional IP telephony is eroding. "What's important to understand is if you're in the business of selling voice over IP and IP telephony in the traditional sense, 2008 was probably your best year," he said. "While [unified communications technology] has been exploding, traditional IP telephony from a revenue standpoint has been dropping, especially in North America." He said IP telephony is declining somewhere in the single digits and low double-digit percentages year over year, displaced by unified communications. "You can do a lot more with voice on a UC platform," he explained. "The standards are broader." He highlighted wideband audio, which provides a richer audio experience than VoIP, as an example of this. "In the world of communications, human beings interact with each other in very nuanced ways," he said. VoIP was never meant to capture these nuances. "I think more and more people are going to be really enamored with things like wideband audio," he said. Audio experience grows in importance when today you're more likely to have conference calls with participants from around the world, he added. "[Participants] may be speaking English as a second or third language. There are nuances to accent, pacing -- there's a subtlety that's there." "At the end of the day, all this technology is for nothing if the human beings at both ends don't have a better collaborative experience. ... So we're trying to do everything we can to make it so that it's a great experience," he said. 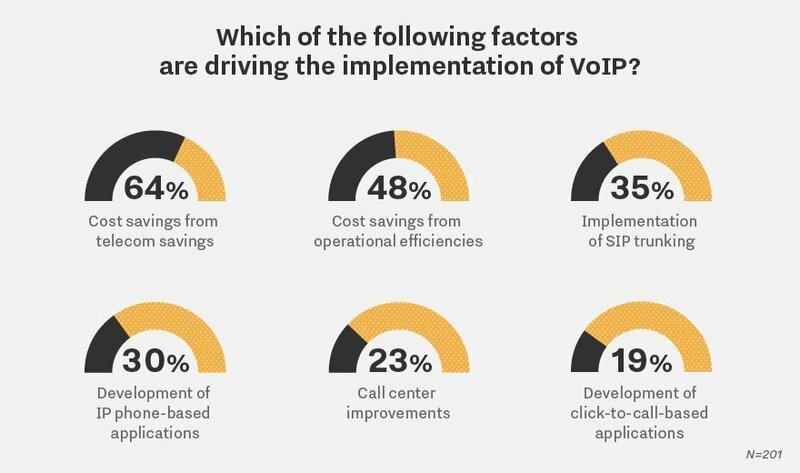 The third-most cited driver for VoIP implementation, cited by 35% of respondents, was the implementation of SIP trunking. In what types of businesses do you continue to do VoIP implementations?